In many places, urban mobility is at a crossroads. Public transport operators and policymakers around the globe are facing the same challenges, such as the advent of autonomous vehicles, and need new strategies and ideas. In order to assess the biggest challenges facing tomorrow's public transport, we present likely future scenarios, as well as courses of action for parties involved, using Germany as an example. Policymakers have a duty to put in place the framework for an effective system that can manage traffic flow in real time. 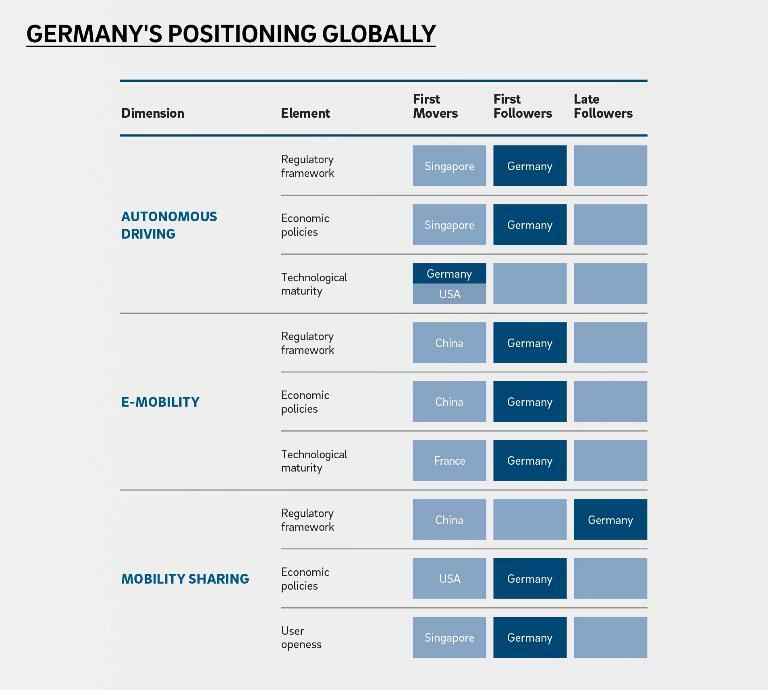 At first glance, the mobility situation in German cities doesn't look too bad when it comes to infrastructure, technology and the legal framework. Despite not being a first mover internationally, Germany already boasts many of the essentials for smart mobility in the modern age. That said, we face a sea change of unprecedented proportions in our mobility systems, even though the country still lacks any kind of considered strategy for realizing integrated transportation systems in urban areas. The reason for this disruption is the emergence of new technologies like autonomous vehicles, which will challenge how attractive we as a collective find public transportation as a means of getting around. Soon enough, even commuters may no longer see the fact that traveling by train or subway is often faster than driving through congested streets as a good reason to take public transport. They would likely rather take a self-driving cab, where they could write e-mails in comfort, make phone calls in privacy or prepare documents for their working day. Riding in one of these robocabs would even save them money, the price per passenger kilometer being about 60 percent lower than the fare for using a conventional taxi. Plus, in the era of electromobility, even the environmental aspect would no longer give public rail transport an advantage. This scenario could become problematic for public transport operators as it would put them at risk of falling into a downward spiral. If customers forsake public transport and turn to robocabs instead, operators will then need to spread their fixed costs among fewer passengers – either that or they will have to rely on government subsidies. This, in turn, will drive up the fares on public transportation, thus pushing even more customers away. The closure of public transport services running at low capacity would even be viewed as a positive thing. But the network effect means that even the core network would be affected, albeit indirectly, because even a relatively minor reduction in passenger numbers of, say, 10 percent on the main routes would be a blow to public transport companies. Anarchy describes a state of affairs in which there is no targeted management of traffic, no collaborative management of connected autonomous vehicles and a complete lack of any attempts to manage the situation through planning and regulation. Robocab services are more attractive than public transport. It takes longer to get around because of the sheer weight of traffic on the roads. 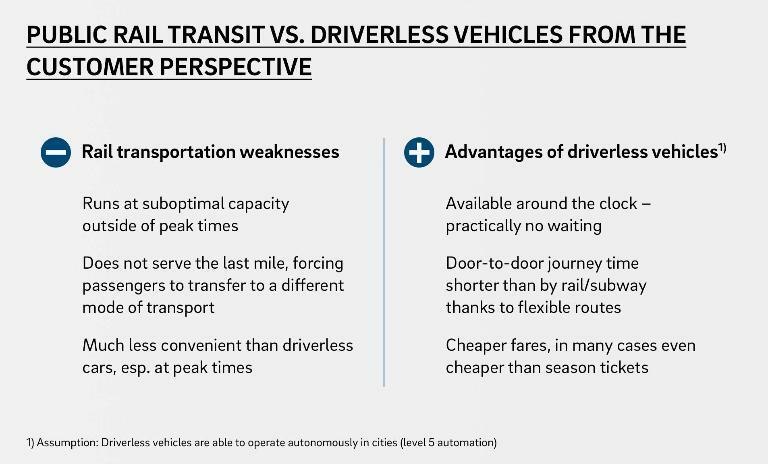 In the maximum capacity scenario, public transport becomes more attractive as there is targeted optimization of services and falling costs – largely due to the prevalence of self-driving systems. The "last mile" – taking customers right to their door – is covered by driverless minibuses, with both public transport companies and private individuals operating them. Regulatory measures are introduced. But there is no interconnected management of the system as a whole. Connected individuality features a high-level, connected universal system that optimizes the flow of traffic between autonomous vehicles and between these vehicles and conventional vehicles. Robocabs are more attractive than public transport. The volume of traffic is considerably higher under this scenario since taking a robocab instead of using public transportation – with the combination of convenience and low fares that robocabs offer – is a more attractive option, and ridesharing remains a niche phenomenon. Hyper-efficiency is the ideal solution for urban areas. Under this scenario, people travel together in a connected system. The transportation system is optimized by means of active traffic flow management, collaborative management of autonomous vehicles and demand-based pricing within public transport and robocab services (through an urban toll system). Public transport becomes more attractive to customers as it is able to cut costs and optimize last mile services. In order to achieve the ideal of hyper-efficiency, we need to rethink the traditional separation of road and rail traffic. While public rail transport should remain the backbone of inner-city passenger mobility, the range of different mobility options available needs to be dovetailed in the passengers' interest. On-demand bus services may represent a solution here. These are essentially minibuses that passengers can call out whenever they need a ride – and these too will be driverless in the future. Public transportation operators can use them to offer a door-to-door mobility service, transporting customers from the train station to their final destination, for example. On-demand buses make money for the companies operating them even on quiet routes on the outskirts of urban areas. Driving only 'on demand', as the name implies, these buses have a better operating cost base than regular rail services because they operate at better capacity – and they prevent passengers from being lost to robocab services. They can also be operated around the clock, thus improving both the service and the customer retention rates. Besides linking up different vehicle options, it will also be essential to adapt the infrastructure. Train stations and the larger subway stations should be turned into even bigger hubs so that passengers can transfer smoothly onto their next mode of transport. Operators need to ensure that the necessary charging infrastructure for their electric vehicles is in place and an end-to-end ticketing system created. For public transportation operators it is important to take steps toward cooperating with the appropriate firms and engaging in technology partnerships. This will give them access to the know-how they need in order to adjust their business model to the new realities on the ground. And at the same time they should seek alliances with policymakers – both with city and local authorities and at a regional and national level – because the hyper-efficiency scenario will require business and political leaders to work together hand in hand and plan out an efficient mobility system. Policymakers have a duty to put in place the framework for an effective system that can manage traffic flow in real time. This involves creating connected transportation systems integrating both public and private operators and developing a concept for efficient regulatory control of traffic flows. Incentive taxes could be one way of managing mobility demand. A dynamic urban toll for driverless and non-driverless individual vehicles would give public transport an even bigger cost advantage vis-à-vis individual transportation. The toll could be more expensive in the rush hour and the price reduced when the roads are less busy. Regulatory control can be easily implemented, just like on-demand buses, in cities large and small. 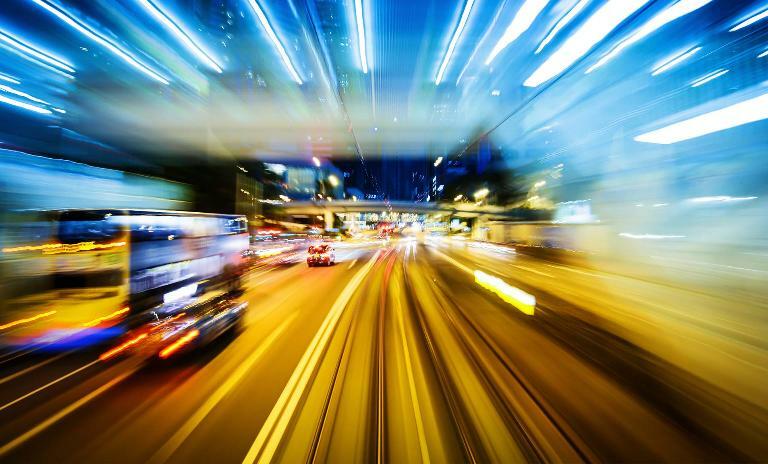 What will be more difficult for the smaller towns and cities to achieve is establishing the IT systems that are needed to enable a connected transportation system to operate. For larger cities the necessary investments and the manpower required will be easier to manage. In rural locations and on the outskirts of urban areas, the main focus should be on the last mile. 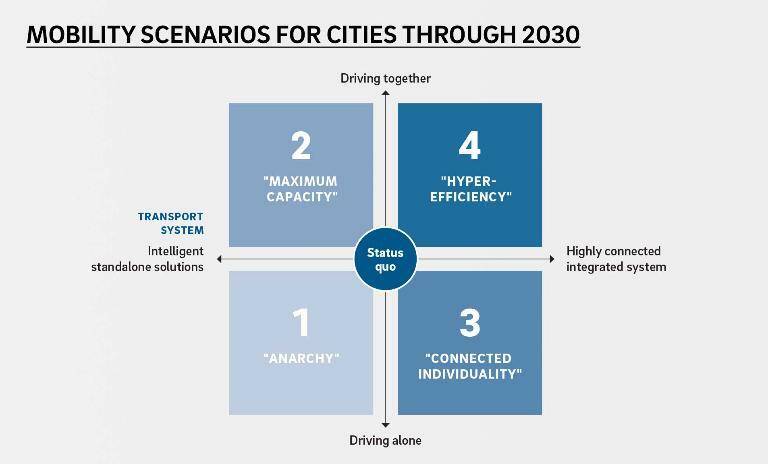 All of this calls for new ideas and approaches to urban planning in order to optimize the transportation infrastructure for electrified and driverless vehicles. Considerable infrastructure investments will need to be made to realize these strategies. However, the greater challenge lies in balancing the many different interests that need to be considered in a connected universal system. Stakeholders include not only public transport operators, but also automakers, private mobility service providers and drivers/car owners. Undoubtedly, there is a pressing need to reconcile stakeholder interests in this way, because if the various automakers are left to their own devices on autonomous driving they will produce nothing but isolated solutions (as in the connected individuality scenario), which would result in even more traffic on the roads. For all stakeholders, a connected universal system is therefore the optimal and indeed the only logical solution. However, it does call for cooperation and mutual understanding, and that can only be achieved with the right kind of political support.